This page Performance is part of the event series. Illustration:Theatrum Orbi engraving by Theodor de Bry from the chapter on Ars Memoriae in Utriusque cosmi maioris scilicet et minoris metaphysica by Robert Fludd. A performance, in performing arts, generally comprises an event in which a performer or group of performers behave in a particular way for another group of people, the audience. Choral music and ballet are examples. Usually the performers participate in rehearsals beforehand. Afterwards audience members often applaud. The means of expressing appreciation can vary by culture. Chinese performers will clap with audience at the end of a performance; the return applause signals "thank you" to the audience. In Japan, folk performing arts performances commonly attract individuals who take photographs, sometimes getting up to the stage and within inches of performer's faces. Theatrical performances can take place daily or at some other regular interval. 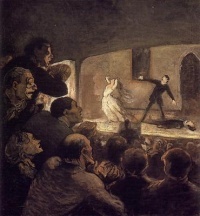 Performances can take place at designated performance spaces (such as a theatre or concert hall), or in a non-conventional space, such as a subway station, on the street, or in someone's home. Live performance events including theater, music, dance, opera, use production equipment and services like: staging, scenery, mechanicals, sound, lighting, video, special effects, transport, packaging, communications, costume and makeup to convince live audience members that there is no better place that they could be right now. This Live Event Support article provides information about many of the possible performance production support tools and services and how they relate to each other. Live performance events have a long history of using visual scenery, lighting, costume amplification and a shorter history of visual projection and sound amplification reinforcement. This article describes the technologies that have been used to amplify and reinforce Live events. The sections of this article together explain how the tools needed to stage, amplify and reinforce live events are interconnected. Unless indicated otherwise, the text in this article is either based on Wikipedia article "Performance" or another language Wikipedia page thereof used under the terms of the GNU Free Documentation License; or on original research by Jahsonic and friends. See Art and Popular Culture's copyright notice. This page was last modified 16:58, 6 December 2016.